Zucchini for breakfast? If you are still swimming in zucchini (even the kind left anonymously in your car at church) here’s yet another way to use them and add some vegetable nutrition to your favorite breakfast pastry. If I had not been served a variation of these in the lovely Twin Turrets B & B in Boyertown, Pa., I likely never would have tried them. But with sour cream and butter in the mixture, in addition to zucchini and pecans, these are light, delicate and the recipe makes me wonder if zucchini and pecans wouldn’t be a great twist on crepes, too. At the Twin Turrets, then-chef Dorothea used walnuts in her pancakes instead of pecans, but the recipe she sent me as a follow up (so sweet) said pecans; since those are what I more commonly keep on hand, I tried pecans at home my first go round and never looked back. In large bowl, combine the milk, sour cream, eggs and melted butter. Mix thoroughly. Add the pancake mix and stir until just combined. The batter will be lumpy. Add the zucchini and pecans or walnuts. 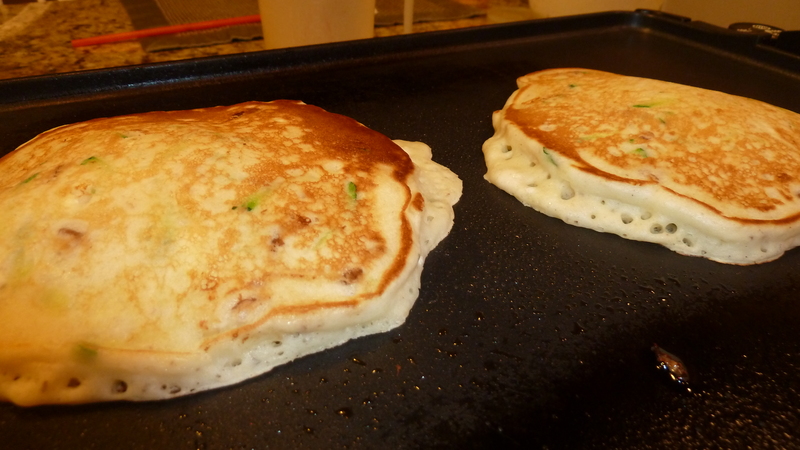 Pour onto a hot, lightly greased griddle or frying pan. Serve with plenty of butter and warm maple syrup. Serves 6 to 8 with 16 smallish pancakes. I made a half batch recently and had leftover batter which was still good up to four days later. Carmen Wyse has a recipe for Greek Zucchini Cakes–served as a side with any summer meal that looks great in my book, Whatever Happened to Dinner. but have shared your recipe with two or three friends who do . Thanks for posting it and for the good pictures as well. Glad you liked the pictures — trying to improve my food photography!! It is fun–like a hobby. Bless you and I hope you have a great weekend. I think your pictrues are great! Hope your weekend is good too . Zucchini bread, muffins, zucchini-chocolate cake, zucchini on shish kebabs, in quiche, stewed with onions, peppers, garlic and tomatoes. 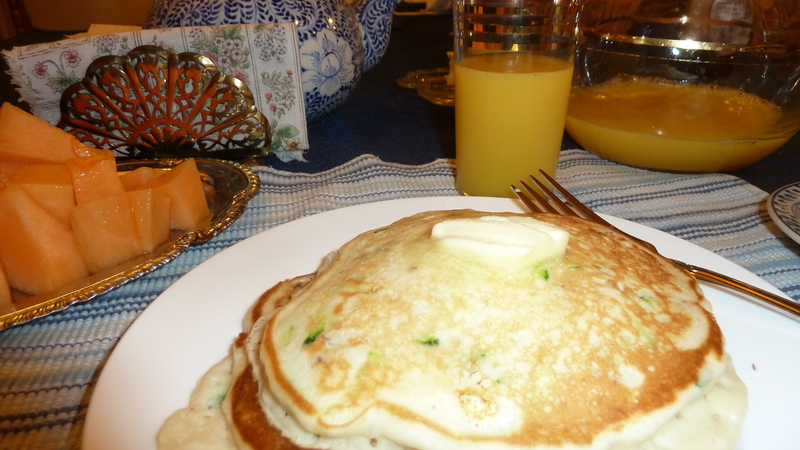 Zucchini pancakes,but they’re like potato pancakes and are served with applesauce and plain yoghurt. In vegetable soup and in chili and in spaghetti sauce. I think the quiche is my favorite. 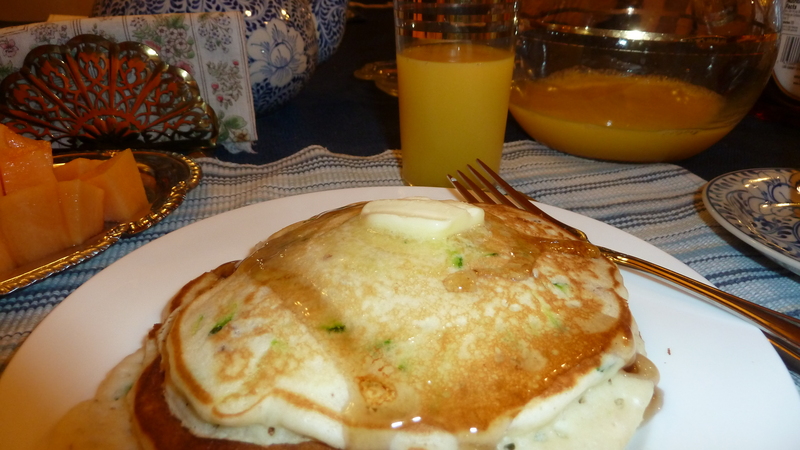 Yeah, the zucchini pancakes I saw online (I did not spend a lot of time looking) were mostly of the potato pancake variety. I would have to say the quiche would be a top draw if there was a buffet with all this spread out! Thanks for your great list. Great! Bev, The fall Valley Living is not out yet, it will be out the last week of August. I will make sure there are copies at Trinity. There is also a picture of Judy LePera in it (taking music lessons) and a short blurb about Beth Trissel’s newest book (Pat and Charles’ daughter). 🙂 I know you will love also love the article about teachers written by Anna Kathryn Eby, a longtime teacher in the valley. And don’t worry, when it is out, I’ll post it on Facebook, a link. Thanks for asking. WHEN WERE YOU AT THE TWIN TURRETS!!!??? You were LITERALLY 2 blocks from my house… and yes, the cook there is AMAZING… My wife and I stayed there for our 10th anniversary and had an excellent time. This was a while ago, circa 2008, when I was visiting radio stations in Pa. Md and Va. about the radio program, Shaping Families, which were then checking with stations to find their likelihood of interest. Did you live there then? Such a lovely town and area. I wonder if the same cook is still there? I didn’t recognize the name on the website. Thanks for the comment–and how interesting to know our lives intersected that closely when I didn’t know anything about you–or blogging, for that matter! Yup… we’ve been living in our current home since April 2001. We stayed there June 2005 and had a wonderful time. « What Do You Get for Grandkids or Greats When You’re 60, 70, 80, 90?